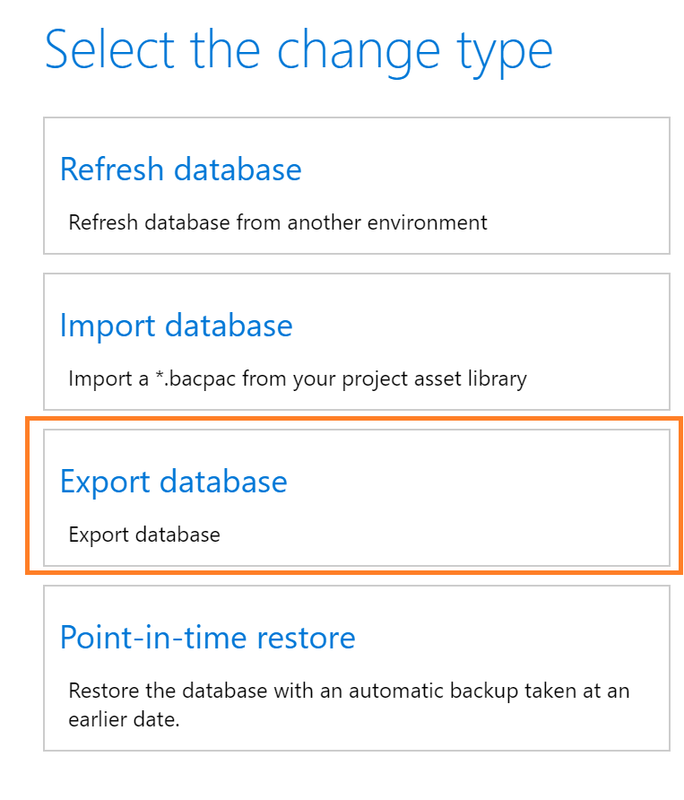 This topic explains how to export a Microsoft Dynamics 365 for Finance and Operations database to a file, and then reimport that file into the same instance or another instance of the application. This procedure can be used only in non-production environments. This topic applies to Microsoft Azure SQL databases that are connected to sandbox user acceptance testing (UAT) environments. You want to make strategic backups that you can restore to later. For example, before or after a major code update, you might want copies that you can use for reference later. You want to back up a database before destructive testing and then restore it after the testing is completed. When you upgrade to a new major release of Finance and Operations, you can use this process to export your old test database and bring it forward to the new version. 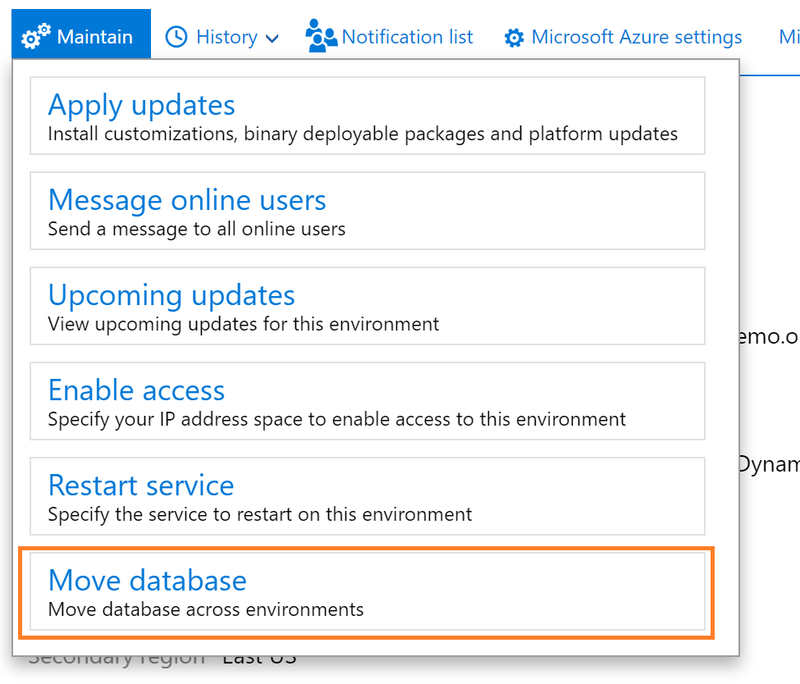 Be aware that Microsoft also provides a standard feature that lets you restore an Azure SQL database environment to a specific point in time within the last 35 days. This restore is done via a service request. For more information, see Request a point-in-time database restore on a non-production environment. This process used to require Remote Desktop access on your Tier-2 or higher environments but no longer does. These operations can be performed using the Self-service actions in Lifecycle Services. From your sandbox Environment Details page, click the Maintain menu, and then select Move database. A slider pane will open on the page where you can use the Export database action. The environment will be unavailable for other servicing operations, such as Sandbox refresh or package deployment during this time. The source environment will be usable from a Dynamics user perspective. After the export operation completes successfully, sign off on the servicing operation on your Environment details page. You can then see the asset in your Asset Library in the Database backups section. The .bacpac files are stored here and can be manually downloaded to your Tier 1 developer environments for import. In the future, Microsoft will provide APIs to trigger the export action, as well as list the available backup files in your asset library. This includes the secured URL for automatically downloading a backup asset file or copying it directly to your secure blob storage using Microsoft Azure Storage SDKs. Use Remote Desktop to connect to all the computers in the environment, and stop the following Windows services by using services.msc. These services will have open connections to the Finance and Operations database. Copy the .bacpac file that was generated during the export step to the AOS computer in the target environment. For performance reasons, we recommend that you put the .bacpac file on drive D on the AOS computer. Open a Command Prompt window as an administrator, and run the following commands. tsn (target server name) – The name of the Azure SQL Database server to import into. You can find the name in LCS on the environment page under Database Accounts. Add the suffix database.windows.net to it. tdn (target database name) – The name of the database to import into. The database should not already exist. The import process will create it. sf (source file) – The path and name of the file to import from. tu (target user) – The SQL user name for the target Azure SQL database instance. We recommend that you use the standard sqladmin user. You can retrieve the password for this user from your LCS project. tp (target password) – The password for the target Azure SQL database user. DatabaseServiceObjective – Specifies the performance level of the database such as S1, P2 or P4. To meet performance requirements and comply with your service agreement, use the same service objective level as the current Finance and Operations database (AXDB) on this environment. To query the service level objective of the current database, run the following query. If the source and target environments have different SQL user passwords, you must run the following script. You must also run this script if you aren't sure whether the passwords differ. Run the script against the imported database. The script drops the database users and then re-creates them so that they have the correct passwords for the target environment. Use Remote Desktop to connect to all the computers in the target environment, and stop the following Windows services by using services.msc. These services will have open connections to the Finance and Operations database. After you stop the services, you can replace the existing Finance and Operations database with the newly imported database. On the AOS computer where the bacpac import was performed, run the following script in Management Studio. This script renames the original database and then renames the newly imported database so that it uses the original database name. In this example, the original database was named axdb_123456789, and the newly imported database was named importeddb. Make sure that you're using the SQL Server 2016 version of Management Studio. Synchronize the database. Open a Command Prompt window as an administrator, and run the following commands. At this point, you can open the Finance and Operations application URL and sign in. Verify that the application works as you expect. Then drop the original database by running the following script in Management Studio on the AOS computer where you performed the bacpac import. Reprovisioning is only required if you are restoring or importing the database on another environment. If you copy a database between environments, the copied database won't be fully functional until you run the Environment reprovisioning tool to make sure that all Retail components are up to date. We recommend that you complete this procedure even if you don't use Retail components, because Retail functionality is included in all environments. Both the default channel database and the default channel data group must be named Default. If you've renamed them, you must change the names back. Follow these steps to run the Environment reprovisioning tool. In your project's Asset Library, in the Software deployable packages section, click Import. From the list of shared assets, select the Environment Reprovisioning Tool. On the Environment details page for your target environment, select Maintain > Apply updates. Select the Environment Reprovisioning tool that you uploaded earlier, and then select Apply to apply the package. Monitor the progress of the package deployment. For more information about how to apply a deployable package, see Apply a deployable package. For more information about how to manually apply a deployable package, see Install a deployable package. After you import a database, the link between the database and document handling documents that are stored in Azure blob storage might be broken. If you have custom code that uses the X++ FileUpload class to put files in blob storage, the links to those files might also be broken.